Life is busy and full of demands and stressors leaving so many of us exhausted, burnt out, depressed and/or anxious. Creating art and engaging in a creative activity is an incredible way to find some peace, joy, and serenity. Art has many medicines to offer and engaging in art- making is fun, healing and restorative. But, many women struggle with having time to create art or fear they aren't or won't be good at it. If you are new to art and afraid you do not have the skills or the 'talent', please let me assure you that art is a learned skill. Six years ago, my skill level was drawing stick people and I took on-line art classes and attended retreats and slowly built my skill. But, I wouldn't have put in all that time learning if I wasn't enjoying myself and being kind to myself. The only way to quiet that inner voice that tells you, 'you can't do it', is to be self compassionate. Notice the voice, but do not believe it! You have beautiful art inside you waiting to be shared. Creating art brings me into the present moment, into stillness. In this space I am not dwelling on the past or worrying about the future. In stillness, I find myself. I find peace, clarity and connection with my real emotions. I struggle with depression and anxiety and creating art has been transformational for me. I am from the Squamish First Nation in Vancouver, Canada. My ancestral name is Tiyaltelwet which was my great, great grandmothers name. 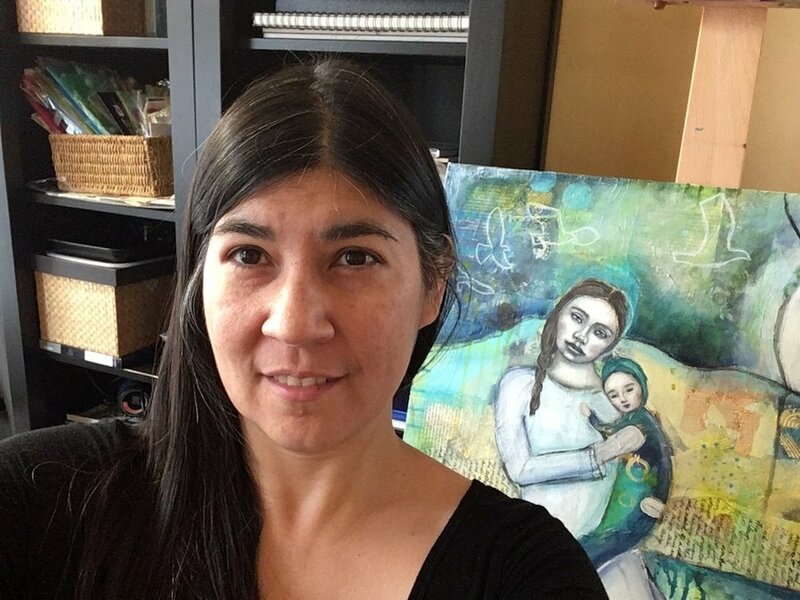 I live in my community and draw from my traditional ancestry and teachings in my art practice. I have a wonderful husband of 18 years who is also an artist. We live in our community with our very large cat named, “Puss”. I believe we are all creative in some way and I am passionate about facilitating opportunities for people to engage with creativity. I am a teacher and facilitator at heart. I am currently studying to become an Expressive Arts Therapist. My 20 years of experience working in the Indigenous health field and in curriculum design and instruction means I carefully design lessons that will guide you step by step through the creative process. In my art, I depict the strength, realness and vulnerability of women. Underneath our negative beliefs of ourselves is our true beauty. We find this through being vulnerable and doing the work of experiencing our emotions. My art and lessons often focuses on portraits. I believe humans are drawn to looking at faces, bringing us into connection with each other. We see ourselves in our common humanity.